A private language spoken between two sisters binds their hearts forever, creating a world only they can enter and explore. Birdie adores her older sister, wants to be like her in every way. There is one thing stopping her—her color. She is lighter in color than her sister, Chloe, who looks like her father: tall in stature and a mid-shade of black; he’s an intellectual focused on little else than writing his book on the meaning of race in America. Birdie Lee’s color leans towards the middle but more on her mother’s side: a white woman with fair skin and blonde hair who tended to be a bit heavy, back when the family was together. It was Boston, the turbulent 70’s, and all that was together was now in pieces. Her mother was involved in some dangerous business and had the feds after her. They had to run. The only thing to do was to split up the family: Chloe and her father off to Brazil; Birdie and her mother, to New Hampshire. A divide leading Birdie into a white world—ever lost; yet, the memory of her secret language drives her to find her sister, to find herself. What an adorable book. It’s apparent why A CatFish Tale won the Book of the Year Award from Creative Child Magazine. From page one until the very last, I smiled from the rhyming verse and the beautiful and colorful artwork. I think, the story, although clever and fun, also shows how hard it is to have self-control sometimes—especially from a cat’s point of view when minding the fish. The poor cat . . . having to wait for something to eat while managing such patience in caring for his charge. The really fun part was the ending, though. I’m not going to give away the punchline. But, I can say that I think this book would brighten any child’s day. I know it did mine. I’m happy to say that this book was given to me in exchange for an honest review. Thank you, so much. I really did enjoy it. Each page of this book has a little poem to match the bright, colorful artwork. The little rhymes are so much fun to read that I found myself eager to keep turning the pages—each one bringing another smile to my face. But, pretty pictures and clever rhymes are not all this book has to offer. There is a powerful message of hope and happiness with a certain can-do attitude to build the confidence of any child. 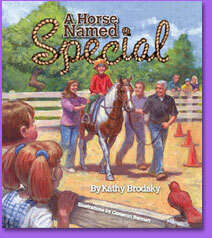 Special is a type of horse like many of the service dogs and other service animals. He gives rides to all types of people as a form of therapy. Some have physical disabilities and some have problems in other areas of their life to deal with. The relationship between rider and horse is an empowering one: bringing new skills in the mastery of horsemanship, which can be life changing when normal physical limitations or emotional issues are continually a challenge to manage on a daily basis. Page after page, the book shows the accomplishments and the self-assurance this type of therapy can provide for people. Even Special has a huge life-hurdle to master, and he comes through the problem just fine through excellent care, hard work and patience. Overall, I found the book delightful, encouraging, and even at the end I was left with a feeling of empowerment and well-being. The little rhymes are still playing in my head, which makes me smile every time I think about them. I think this book is great fun and a wonderful book for a child of any age. I’d like to thank Kathy Brodsky for the lovely copy of her book in exchange for my honest review. The reason I wanted to read and review this book is that brain science is a very important subject to me. I’ve had three serious jolts to my head, all were life altering. Brain science is still a subject that needs a lot more study and investigation in my opinion. The brain goes through so many changes in a lifetime: car accidents, sports accidents, kids falling down hitting their heads, hormonal changes, diet, old age . . . it’s a wonder we survive all of this trauma. The big problem is that when these injuries occur, most people don’t realize any damage has been done. They just know that people suddenly are reacting differently to them, they can’t do math any longer, they lose control of their spending habits, engage in risky behavior, or they can’t perform as well as they were able to before. That is why this company is so important to all of us. They’ve been tracking brain health and neuroscience research since 2005. They’ve gathered a lot of information from the top scientists around the globe to make us more aware of how to take care of our minds—to make us wiser in how to change our brains and gain the specific function we have lost over the years. The book is divided into nine chapters. Eight of the chapters include interviews from some of the top brain scientists from around the world. Over 100 brain researchers have contributed to this volume providing invaluable information on the subject. In chapter one, “Start with the Brain in Mind,” the text goes into detail about how the brain functions with a focus on memory, attention, emotions, perception, motor skills, visual and spatial processing, and executive functions. The explanations give real-life examples, so that a person can easily relate to the different areas of function. Neurons are clearly explained, areas of the brain and functions, like memory, attention, etc., are lightly touched upon. Neuroplasticity is explained and how to improve learning capabilities. In chapter two, “Be a Coach, not a Patient,” some of the advancements in brain health are brought to light. There is a breakdown of a survey taken about what the average person is most concerned with in their brain health. Various new studies are examined and explained, plus a few tips that are theorized to help cognition. In chapter three, “Mens Sana In Corpore Sano,” physical exercise is examined in detail — new studies that show the benefits to the brain through exercise and how it can slow the progression of brain atrophy as we grow older. In chapter five, “Oh, the Places You’ll Go,” different types of mental activity are mentioned and the importance of continuing to learn new information. Crossword puzzles are discussed and why they aren’t enough, and how they lose value over time. Another important subject is brought up: how to delay the onset of Alzheimer’s, and the importance of lifelong learning to buy more time. What education, board games, and playing cards have in common. And, a few video games are highlighted as helping various brain functions. In chapter six, “Oh, the People You’ll Meet,” explains the importance of brain health and social relationships. The more social connections one has the healthier the brain is. In chapter seven, “Manage Stress, Build Resilience,” There is good stress and bad stress. Chronic stress causes serious changes in the body chemicals and the brain. A section of lifestyle adjustments are suggested with highlights on the benefits of the various options listed. At the end of this chapter is a long section with many specialists explaining the effects of stress and the changes we can make to improve our brains and bodies. In chapter eight, “Cross-train Your Brain,” Brain training is explained in detail and how to get the most from the training you choose, as well as brain training games, biofeedback, cognitive behavioral training, and a SharpBrains recommendation on the top brain training programs. In chapter nine, “How to Be Your Own Brain Fitness Coach,” is a chapter to put everything in the book into a workable plan. There are personal stories explaining how various people can deal with improving their brains and life in general. 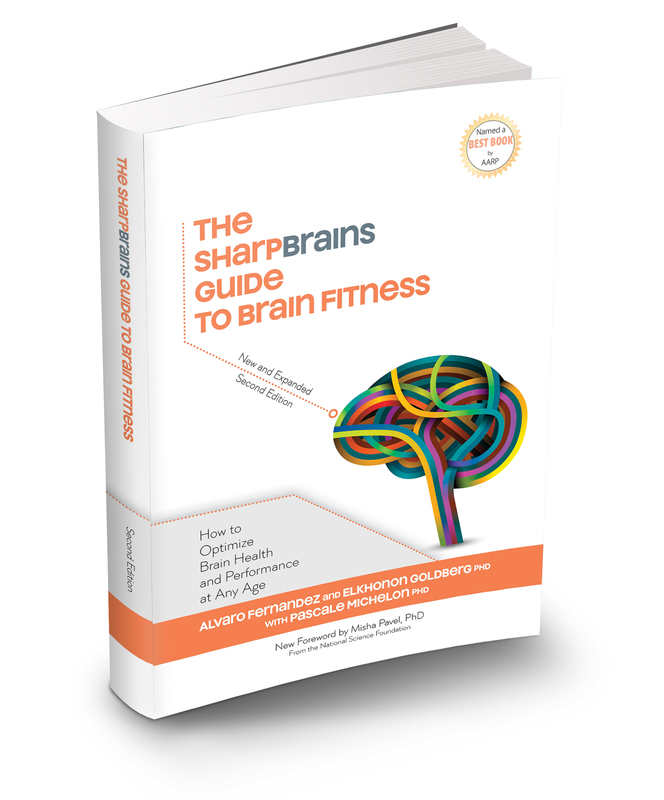 Overall, “The SmartBrains Guide to Brain Fitness” is full of valuable information. Whether you want to target a specific area in your life or whether you want to just tune-up the whole brain-body connection, this book has so much to offer. It takes complex principles and puts them in simple language that is easy to understand, and it offers a deep understanding of how our brains work, and what we can do to make it better—even as we age. This is a must-read for anyone concerned about their brain health. I told someone that I would let them read this book when I am finished with it. I don’t want to let this go now. I think I’ll buy them a copy of their own. I’d like to thank the authors for this complimentary copy in exchange for an honest review. Faint noises came from the hall. Merri and Abby started then looked at each other, wide-eyed. Someone knocked softly on the door, and a smile bloomed on Abby’s face. “It’s our secret knock,” she explained as she race-walked to the door. John came in loaded down with plastic shopping bags. How he managed to lug it all up without being seen was a mystery they didn’t take time to discuss. “What else?” Merri said, unable to tamp down her curiosity. “I’m all in favor of good hygiene,” Abby said. “Instant?” Merri said without bothering to keep the disgust from her voice. Abby took the bag from him, closed it firmly, and put it on the counter. I wanted to let you know that my books Alaskans: Stories and A Man of His Village are out in their new Denali Press print and eBook editions. Details at www.denalibooks.com or www.tanyo.net. KOBO (www.kobobooks.com) is having a 30% off summer sale on all their eBooks until Monday, July 28, 2014. This includes my eBooks, which are available at Kobo (as well as Amazon, etc.). Readers who use Apple e-readers and are interested in posting a review of either of my books at iTunes can have a promo code for a free copy of either eBook — Please contact me at www.tanyo.net. Also, a recent TR author interview will be posted starting next week on July 28, 2014 at www.49writers.blogspot.com and www.selfmadewriter.blogspot.com. Thank you for your interest, and feel free to contact me if you have any questions. My favorite line from “Cossacks” is, “Happiness is grace, it’s bounty. It’s free of charge, it’s given to you. You don’t win it. You don’t earn it. You don’t deserve it. You say yes. You just say yes” (page 139). There is a flavor of art in the author’s writing. Not art you would see in a museum or in a painting, and not in a sense of painting with words (although Ravicz does a fine job of this as well), but more as “art with a sense of feeling.” Each story is different. Each story is told in another voice from the author from a different period in his life. Had I not known that I was reading from the same book, I’m sure I wouldn’t be able to tell who had written the various tales. They are unique. The prose is strong, thought-provoking, and colorful. “A Fox in May” is about a young boy who is thirteen and is stuck bet ween childhood and being a young adult. He takes on the responsibility of raising chickens, from building the coop to feeding and caring for them. Throughout these lessons, he learns to love those chickens and does a great job of raising them. There are so many questions unanswered at this age for a young boy–so many trials to pass to get to the other side of young adulthood without losing the respect from elders. Through nature, he learns about death, and living, and loving, and being a part of the cycle–what it takes to endure–no matter how difficult that can be. “The Ballad of Robbie Fox” is a story told from someone struggling at the bottom of the pile and trying to claw his way up and out. It is raw, edgy, strong prose that feels like it just came off the streets and into your living room, or like talking to your new best friend at the local bar after tossing a few back. There is a feel to this Robbie Fox, like someone you know, or have known, or maybe it’s even you. There’s a truth from someone’s heart in this . . . it’s the hard kind of truth about life. autiful the Paxson Lake area is. I really enjoyed all these stories (well, except for one–I’m squeamish about dressing a kill). Tanyo Ravicz is a talented author, and I’m pleased for the opportunity to review this well-written anthology of Alaskan tales. Also, my thanks goes to Review the Book.com for allowing me to review this book.